Last spring, I picked up this brushed cotton plaid Topman shirt at Chigwell boot sale for only £1.50, little did I know then that plaid shirts were going to be in trend this winter! They are a great all year rounder and can be worn as is, or layered over a polo neck for the colder days that are around right now. Will you be into plaid this winter? You did well - again! It's a lovely colour on you. Great look, Sharon! I have not found one that I like-yet. Enjoy your saturday! Hi Fiona-I'll be right over, thanks so much! Hi La Mimi-Yes, it is a great trend, thanks my dear! Hi Athena-thanks for stopping by with your lovely comment! Hi Silje-haha, I'm sure you'll track one down! Thanks my dear! love the shirt. last spring - you trendsetter! actually i am looking to thrift some plaid ones myself if i get so lucky! Hey you look great, so well done! Yes I'm def in plaid for winter. 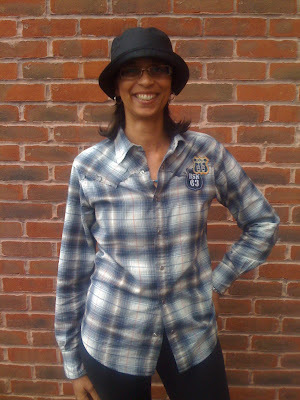 Hi karima-you should get one thrifting, fingers crossed, thanks my dear! Hi the seeker-always lovely, thanks so much! Hi marian-thanks as always for your sweet comment my dear! Is this also part of the trend that Katie Holmes and some are doing ..where its like you're wearing your boyfriend clothes? Very cool look you have going. I like your hat too. Thanks so much for all your comments. I greatly appreciate them. I do like plaid, but I didnt buy a plaid shirt I went down the skirt and dress route instead. But your shirt looks so fabulously warm i may have to reconsider! I have been wanting one so I can mimic the look of a particular chickdowntown ad I've seen - fitted plaid button-down, torn & rolled bf jeans & tall clog-like shoes. but, sigh... it will be spring soon & I might not be in that mood anymore. I'm behind on my winter wishlist LOL. Hi ellie-yes, the boyf trend is still very much about, thanks for your comment too! Hi fashion dreamer-yes, do consider it, you can wear it open in summer over a camisole and a denim mini skirt. Hi Miss Amy Shops-thanks for stopping by, hope you can get some of those items you're after! What a lovely shirt! I am loving plaid for winter as well - it's such an outfit staple. P.S. I'm finally back in the "blogosphere" - new updates on my blog! I have a thing for plaid shirts, but in some way I don't have anything with plaids! Little bit weird.. But that shirt looks really good on you! You look so cute and happy in that picture! Hi everyone-thanks for your lovely comments, much appreciated! you look great in plaid!